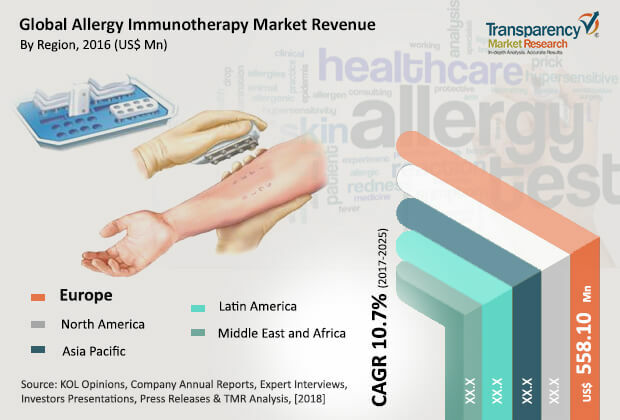 The global allergy immunotherapy market was valued at US$ 1.37 Bn in 2016 and is projected to register a cumulative annual growth rate (CAGR) of 10.7% from 2017 to 2025, according to a new report titled, “Allergy Immunotherapy Market – Global Industry Analysis, Size, Share, Growth, Trends, and Forecast, 2017–2025”, published by Transparency Market Research (TMR) in April 2018. The report states that high prevalence of allergy diseases across the globe, rise in awareness about allergy treatment, increase in funding for clinical research and grants, launch of new therapies, etc. are expected to spur the growth of the global allergy immunotherapy market during the forecast period, i.e., from 2017 to 2025. North America and Europe are projected to dominate the global allergy immunotherapy market in the near future, primarily due to the large base of patients suffering from allergy diseases, high clinical R&D budget to address the unmet needs of the market, launch of new therapies, and increase in awareness regarding allergy treatment in these regions. Europe is estimated to dominate the global allergy immunotherapy market by the end of 2025, which can be ascribed to the high prevalence and rise in incidence rate of allergy diseases in the developed countries in the region such as Germany, France, the U.K., and Italy, promising product pipeline, and initiatives undertaken by the government and non-profit organizations to promote awareness regarding allergy diseases. The allergy immunotherapy market in Europe is expected to register a CAGR of more than 11.5% from 2017 to 2025. Allergy immunotherapy, also referred to as desensitization or hypo-sensitization, is a medical treatment targeted against different types of allergies. There is an increase in the prevalence of allergy, and pharmacotherapy, by itself, is insufficient to control the rate of occurrence. Allergy immunotherapeutic treatment boosts immunological tolerance as well as alters the course of the disease. According to the American College of Allergy, Asthma & Immunology, it is estimated that allergies are the sixth leading cause of chronic illness in North America. As per Centers for Disease Control and Prevention (CDC), more than 50 million Americans experience different types of allergies every year. Immunotherapy treatment can help reduce allergy symptoms in around 85% of the people suffering from allergic rhinitis. As per the European Academy of Allergy and Clinical Immunology (EAACI), in 2014, more than 150 million people in Europe are suffering from chronic allergic disorders and it has been estimated that by 2025, over 50% of the population in the region will be affected with allergy diseases. According to the World Allergy Organization (WAO), in 2010, around 30% of the global population suffered from allergic rhinitis. The rapidly growing patient pool, coupled with launch of new therapies and increasing awareness regarding allergy treatment, is projected to drive the allergy immunotherapy market during the forecast period. The report offers detailed segmentation of the global allergy immunotherapy market based on treatment type, allergy type, and distribution channel. Among treatment types, the sublingual immunotherapy (SLIT) segment is poised to account for a dominant CAGR of the global allergy immunotherapy market during the forecast period from 2017 to 2025. Recent approval by the United States Food & Drug Administration and launch of new therapies such as Oralair, Grastek, and Ragwitek in 2014 had significantly impacted the sublingual therapy market in 2016. Also, the recent launch of Odactra aimed at the treatment of allergy caused by house dust mite (HDM) is estimated to propel the growth of the sublingual immunotherapy segment during the forecast period. In terms of allergy type, the allergic rhinitis segment is projected to dominate the global allergy immunotherapy market during the forecast period and expand at a CAGR of more than 14% from 2017 to 2025. According to the American Academy of Allergy, Asthma & Immunology, around 10%-30% of the world population is suffering from allergic rhinitis. As per the U.S. Adults: National Health Interview Survey, 2012, over 8% of adult population in the U.S. suffered from allergic rhinitis. Also, in 2011, it was estimated that around 230 million people across the world suffered from asthma. As immunotherapy can significantly restrict asthma symptoms, it is used routinely among the asthmatic population, thereby driving the allergy immunotherapy market. Among distribution channels, the hospital pharmacy segment is projected to hold a dominant share of the global allergy immunotherapy market during the forecast period and expand at CAGR of 9.9% from 2017 to 2025. Easy availability of allergy immunotherapy drugs at hospital pharmacies and expansion of leading pharmaceutical chains across the globe are driving the growth of the segment. The online pharmacy segment is the second-leading shareholder of the global allergy immunotherapy market, after the hospital pharmacy segment. The online pharmacy segment is poised to expand at a significant CAGR of more than 12.5% during the forecast period. In terms of value, Europe dominated the global allergy immunotherapy market in 2016. The region is estimated to gain market share by the end of 2025. The dominance of Europe can be primarily attributed to the high prevalence of allergic disorders in the region, launch of new therapies for allergy treatment, and high clinical R&D budget allocation to address the unmet needs of the market. The allergy immunotherapy market in Europe is estimated to expand at a significant CAGR of 11.5% during the forecast period. North America is another attractive market for allergy immunotherapy. Rapid growth of allergic population in the U.S., rise in awareness regarding allergy treatment, and new product approvals and launches in the region have contributed to the dominant share of North America in the global market. Moreover, high clinical R&D budget allocation by the government of North American countries, private players, and non-profit organizations is estimated to fuel the expansion of the allergy immunotherapy market in the region during the forecast period. The allergy immunotherapy market in Asia Pacific is poised to grow at a swift rate during the forecast period. The report also profiles the leading players operating in the global allergy immunotherapy market. Stallergenes Greer, ALK-Abello A/S, Allergy Therapeutics, Merck KGaA (Allergopharma), and HAL Allergy Group are some of the prominent players in the market having proprietary products and technologies. Most of them are focused on new product development, approvals, and commercialization of novel drugs to gain first-mover’s advantage and address the unmet needs of the allergy immunotherapy market. For instance, in 2014, Stallergenes S.A., received approval of the United States FDA for ORALAIR, the first immunotherapy tablet for the treatment of grass pollen-induced allergic rhinitis. In the same year, Alk-Abello A/S obtained approval for Grastek for the treatment of the same disease. In 2017, the United States FDA approved Odactra by ALK-Abello A/S, intended for the treatment of house dust mite allergy. Other prominent players operating in the global allergy immunotherapy market include Biomay AG, Anergis, Aimmune Therapeutics, Circassia, and DBV Technologies.